I will let readers feast their eyes upon the marvelous English text without critiquing the translation at every turn. In point of fact, the translation is not so bad; it's the Chinese original that leaves one's mouth gaping. Instead, I will only discuss the name of this wonderful lotion, which is encapsulated in the logo, and a few other interesting features of the language on the packet. 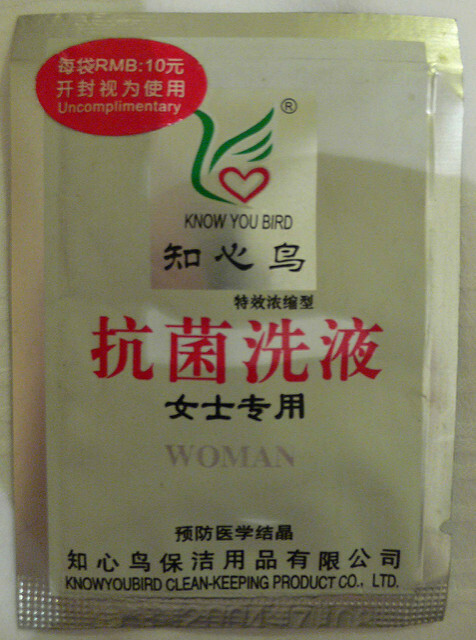 "intimate (lit., 'know the heart') bird, especially for ladies"
I suppose that, by "heart", they mean "your heart", so that, in a circuitous fashion, would account for the "you". The other phrase I wanted to talk about is "brand-new disinfecting gene from Switzerland". I was more than a little discombobulated by this miraculous gene from Switzerland, till I looked at the Chinese, that is. What the Chinese says is Ruìshì xīnyǐng shājùn yīnzǐ 瑞士新颖杀菌因子", which means "brand-new bactericidal factor from Switzerland". It seems that the translator confused yīnzǐ 因子 ("factor") with jīyīn 基因 ("gene"). 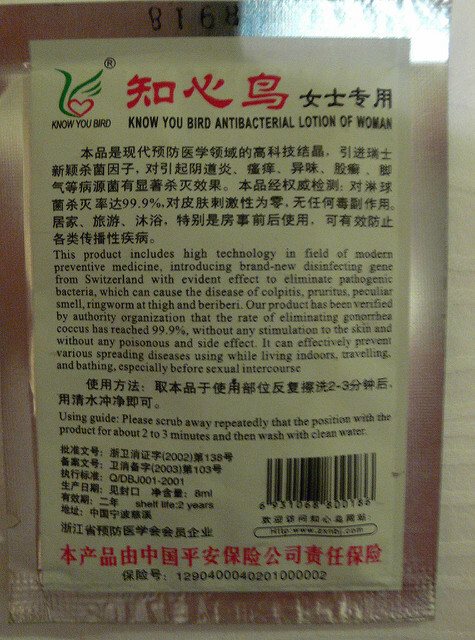 Here it says very clearly that this is kàngjùn xǐ yè 抗菌洗液 ("antibacterial lotion") that is nüshi zhuanyong 女士专用 ("especially for women"), which they translate as "WOMAN". KNOWYOUBIRD CLEAN-KEEPING PRODUCT CO. LTD.
…which they cleverly render as "Uncomplimentary". I would pay a considerable sum of money to see the "MAN" sachet, front and back. Beri-beri is a vitamin deficiency. Treatment consists of eating thiamine-rich foods or in emergency cases receiving intravenous thiamine. Are they expecting hotel guests to ingest or inject this stuff? There is an author called 知心鸟 at Wotiao, which is some kind of life advice site. The author describes himself thus: 知心鸟专门为大家提供各种教师、家长、学生资源的小小鸟，希望我将成为您成长道路上的一位知心小伙伴。The meaning is something like "Intimate Bird is a little bird who specifically provides all kinds of resources for teachers, parents, and students. I hope I can be a small intimate partner on your road of growth." I've translated 知心 as 'intimate', but the meaning is that the author is someone who can be turned to like a true and intimate friend. What they're translating "beriberi," jǐao qì 脚气, here should be translated "athlete's foot" or "tinea pedis" instead. This Chinese term has meant all sorts of things historically but came to be associated with beriberi in the late nineteenth century in Japan, and in the twentieth century the beriberi translation was carried back to China, where it still appears as the first dictionary definition of jǐao qì 脚气. So that's probably how the translator came up with that, even though the far more common colloquial understanding of jǐao qì, and clearly the one intended here, is athlete's foot. I'm pleased that Hilary Smith weighed in on jiǎoqì 脚气, because she is THE expert on this complex of diseases (I know that because I read her dissertation). As a former basketball player, I'm quite familiar with jiǎoqì 脚气 when it means "athlete's foot", fortunately not when it means "beriberi". "Japan: crazy over portmanteaux" (7/26/16) and in this comment to that post. 高级 gāojí would normally be understood as 'high class' or 'high quality'. Hilary Smith: Is athlete's foot no longer known as 香港腳 on the mainland? Or has it always been Taiwan-only? What's next? diagramming Dr. Bronner's soap label? Sorry for the delayed response — yes, 香港脚 is also used on the mainland, but 脚气 is more common, I think (though it may depend on which part of the country you're in). Most people I've talked to seem to think of 香港脚 as colloquial and 脚气 as more formal.